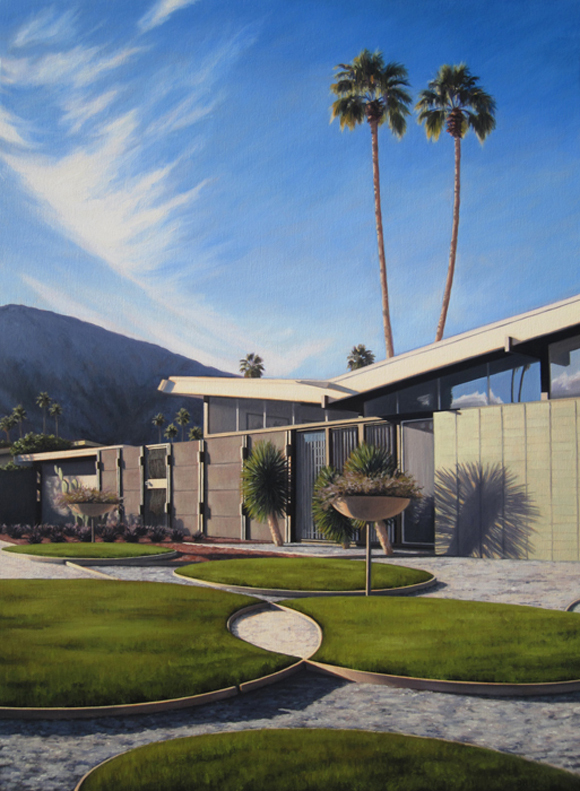 The painting depicts a house in Palm Springs, and while it’s not photorealism, exactly, it exhibits a level of detail that approaches that mind-bogglingly intricate style. The artist, Danny Heller, makes paintings of midcentury modern architecture — particularly of such buildings standing in Palm Springs — and he does so very well. And while that’s intriguing to me on its own, I find Danny’s art interesting because he represents a phenomenon among twenty- and thirty-year-old Americans with a particular aesthetic sense: He’s into a style of buildings whose heyday arrived and left long before he was born. Why is it that you have these children of the 1980s making googoo eyes at buildings our grandparents might have lived in? Or, even more strangely, buildings they might have dismissed back in the day as being angular, awkwardly futuristic and rather stark compared to what all else might have been fashionable in the day? These are the subjects I explore in the article. You should read it. I welcome your feedback. I look forward to how the clever minds who might read my blog could further the conversation I began. But here’s the thing: I also would just like you to click. See, the way articles work on the website hosting my piece, the most clicked-upon, most-Facebook-liked articles get put in the running to become a short-form documentary, and that documentary may even run on TV. So I am asking you, loyal readers of Back of the Cereal Box, to hit that link (step one) and click the Facebook button at the top of the article (step two), all in an effort to have this be the most heavily trafficked, most “liked” post this week.